Vincent Security | Are Security Doors Effective? Security doors are becoming increasingly prevalent in homes across Brisbane and South-East Queensland. There are many reasons for this and arguably the most significant of these is the pervasiveness of crime – property crime in particular – within many areas of this region. Before appreciating the benefits of security screens, it is important to first understand their importance in breaking the cycle of crime. This guide seeks to investigate the question – are security doors effective and how such doors might alleviate a number of important issues pertaining to security and practicality, within an average home. As the name would suggest, the primary function of security doors is to inhibit the entry of criminals and protect the home’s inhabitants from the consequences inherent of an unlawful entry. Security doors do this to varying effect and their efficacy is generally determined by the quality of their design. A good quality security screen will have considerable success in this regard and there are numerous reasons for this; some of which are listed below. This is an extremely important factor in the quality and effectiveness of a security door and it often the downfall of those that are not built to a high standard of quality. Typical screen doors are constructed by using a rubber or plastic wedge to seal the screen into the frame of the door. This serves its purpose adequately, however a join of this nature has almost no resistance to impact and as such, can be forced open with relative ease. A good quality security screen will attach to the frame of the door using a method that provides considerably more strength and impact resistance. An example of an ideally built screen door is one that screws the mesh into frame, clamping it with substantially more force and drastically improving its impact resistance. Impact resistance is of little use if the screen itself is easily damaged. Decorative screen doors or flyscreens often utilise nylon mesh as opposed to a stronger alternative. This might provide a lightweight screen capable of stopping insects, but any more significant force will invariably break through the screen. Additionally, nylon can be cut with ease and prospective criminals can enter a home without detection as a result. Quality security screens mitigate this shortcoming by incorporating a stainless steel mesh in place of nylon. There is no comparable substitute to stainless steel for these purposes and this becomes apparent when looking at the impact and cut resistance of aluminium. Aluminium is used as a cheaper, lightweight alternative to steel by some security door manufacturers and, whilst it may be marginally lighter in weight, it has markedly less utility in ensuring the security of a home. Another important feature of quality security doors is the lock. Locks should be of a quality as high as the door and ought to have the capacity to withstand even more impact. Contrary to popular opinion, security doors are of considerable utility in a practical sense. As well as securing a home from intruders, these doors are a simple addition capable of vastly improving the liveability of homes in a number of ways – particularly given the climate of the Brisbane region. Listed below, are some of the ways in which security doors can enhance the comfort and practicality of an average home. With temperatures soaring in the summer months, most Brisbane houses require expensive air conditioning systems to remain at a comfortable temperature. This often requires a great deal of electricity and the consumption thereof can prove costly to an average family. Often, the design of a house is the predominate cause of its temperature and it has been calculated that thirty per cent of solar heat is gained through a home’s glass. Installing a security screen to glass doorways and windows has a similar effect to tinting the glass, with quality steel security screens able to reduce solar heat gain by up to fifty per cent. Further to this, the permeable nature of mesh allows for the penetration of wind into a house which will work concurrently with the shading to significantly cool the home in which it is installed. This will drastically lessen the necessity of air conditioning throughout summer and might save a considerable amount of money on power, with the benefit of enhanced security. Quality security doors needn’t be an unattractive addition to a house – rather they can provide a minimalistic design appeal. The upkeep required of security screens is marginal and as such, they maintain a clean and uncluttered appearance at all times. The simplicity of their design is applicable in almost all homes and can have a shadowing effect, which exacerbates the angles of a house and has a modern aesthetic advantage. Where have security doors been utilised to greatest effect? Industry research suggests that security doors have been in high demand throughout the newer residential estates of the Brisbane region. These are within close proximity to some of the areas in which crime is most prevalent across South East Queensland and the benefits of purchasing in a modern residential estate can have hidden liabilities. The houses that constitute these residential areas are an appealing purchase – they have modern fittings and appliances, modern designs and they are quite large in size. However, the production of these houses is such that precedence is placed upon the design and efficient construction of homes, so as to establish the estate as quickly as possible. As a consequence, little thought is given to the security of the home and quite often, doors and windows are installed to a standard that can be circumvented by prospective criminals. This, coupled with the abundance of crime in nearby towns such as Caboolture and Narangba, creates a situation in which criminals can easily enter new suburbs in search of vulnerable homes. 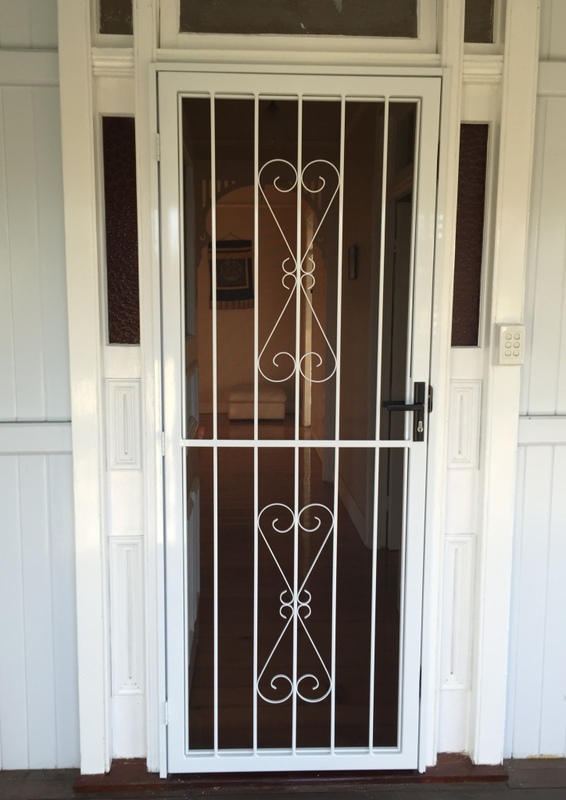 Effective security screens are easily recognisable and have a deterrent effect, thus meaning that the uniformed installation of such doors not only has the potential to protect individual homes, but also to lessen the impact of crime across entire suburbs. It is evident therefor, that security doors are an advisable addition to a vast majority of homes across the Brisbane region. Contact Vincent Security today, experts in security doors in Brisbane.